The oil majors entered the West Duvernay in 2008-2014. Returns in the west Duvernay are below reasonable thresholds. Large independents like Paramount shifting activity to the higher return East Duvernay. 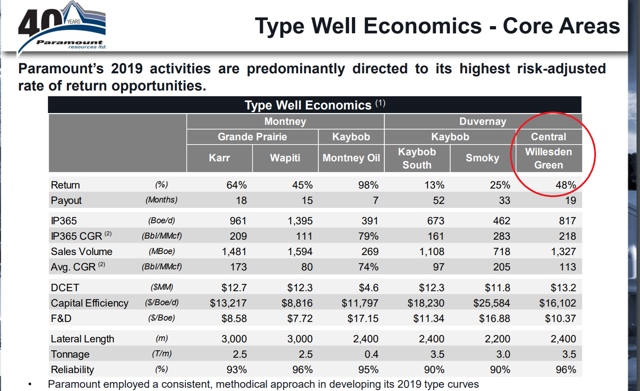 The oil majors (and Kuwait) paid up to get into the West Duvernay: Chevron (CVX) made a splash buying into the Kaybob area (West) Duvernay in 2013, paying just under $1 billion for 67,900 net acres, or just under $15,000 per acre. Production through Pembina's (PBA) facilities should come online later this year. Chevron resold 1/3 of its position to Kuwait's FPEC in 2014 for around $15,000/acre. Exxon (XOM) bought Celtic in 2012, acquiring 104,000 net West Duvernay acres and other assets for $3.1 billion. Shell (RDS.A) bought Duvernay Oil for $5.27 billion in 2008 and it incidentally resold much of that in 2016, including 145,000 net acres of Duvernay, back to the team that ran Duvernay and now runs Tourmaline (OTCPK:TRMLF) for $1.369 billion. PetroChina (PTR) bought into a joint venture with Encana (ECA) in the Duvernay in 2012 for just under $10,000/acre. This is a map from Murphy (MUR), which JV'ed into their West Duvernay position in 2016 for a less onerous price. 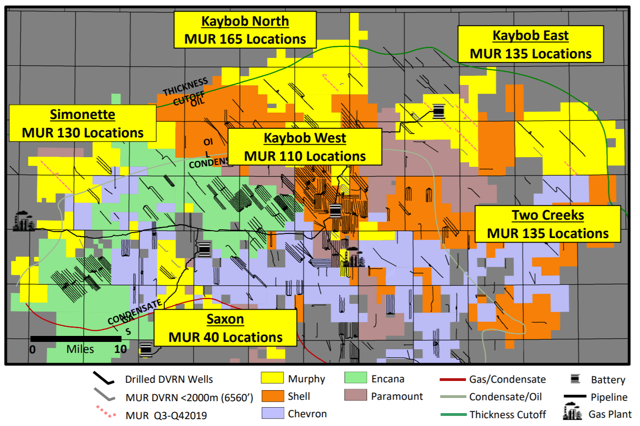 It shows Shell, Chevron, Encana and Paramount land positions in addition to Murphy's. XTO's (Exxon's shale subsidiary) is nearby. In the presentation the map came from, Murphy notes that it is drilling in the Duvernay with a limited budget for "land retention" and doesn't highlight development economics. This map shows Exxon / XTO (in light purple) and is otherwise similar to Murphy's map above. 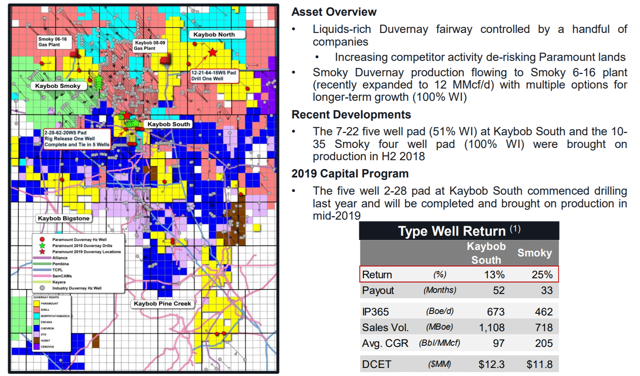 It also shows Paramount's estimate for drilling rates of return at Kaybob South and Smoky. This is notable for a couple reasons. One, it shows low returns in the core of the West Duvernay. And two, kudos to Paramount's management, they might be one of the only oil companies in the world to show drilling economics when they aren't stellar. I can't emphasize how unusual it is for oil and gas companies to display rates of return below 30%. This displays a high degree of honesty and integrity by Paramount management, and means that the returns they are showing are much more likely than usual to be accurate. 1) Chevron and others may experience lower than typical full cycle returns on this project. While Chevron is an integrated oil major, it is using a third party midstream provider just like Paramount is, and with adjacent land and similar well costs, it may experience similar returns to Paramount's. 2) Oil majors that entered the play paying $10,000-15,000/acre likely substantially overpaid. Shell experienced some of this in the re-sale of a portion of the assets they bought for 1/5 of the initial price, and Murphy got in for about 1/4 of the previous going rate, albeit for a land position on the fringe. Exxon has already taken a $2 billion write down on its XTO acquisition, but more may be coming from them and others, at least partly driven by the West Duvernay deals described here. 3) Maybe ramping up exposure in the Duvernay wasn't a bad idea, but the previous focus on liquids rich gas in the West at Kaybob may have missed the mark - oily East Duvernay is much higher return, at least according to a reputable independent operator with large exposure to both. This is intriguing from an investment perspective, and I have some exposure. Additional disclosure: Opinions expressed herein by the author are not an investment recommendation and are not meant to be relied upon in investment decisions. The author is not acting in an investment adviser capacity. This is not an investment research report. The author's opinions expressed herein address only select aspects of potential investment in securities of the companies mentioned and cannot be a substitute for comprehensive investment analysis. Any analysis presented herein is illustrative in nature, limited in scope, based on an incomplete set of information, and has limitations to its accuracy. The author recommends that potential and existing investors conduct thorough investment research of their own, including detailed review of the companies' SEC filings, and consult a qualified investment adviser. The information upon which this material is based was obtained from sources believed to be reliable but has not been independently verified. Therefore, the author cannot guarantee its accuracy. Any opinions or estimates constitute the author's best judgment as of the date of publication and are subject to change without notice.